Rico Rodriguez, the great Jamaican ska trombonist, has died this week at the age of 80. In the UK he's best known for his work with The Specials, including playing on 1981's Ghost Town. The record famously reached number one in the week of the July riots that swept the country that year, and was actually recorded in the week of the first Brixton riot in April 1981 - a precursor to the long hot summer that was to come. The song's lyrics seemed to have anticipated the uprisings with its lines 'This place, is coming like a ghost town, No job to be found in this country, Can't go on no more, The people getting angry'. Even the video seemed with hindsight to refer to rioting, with the band throwing stones - though into the Thames at Rotherhithe rather than at the police. During the Brixton riot, The George - a pub with a racist reputation on the corner of Railton Road and Effra Parade -was burnt down. A new pub, Mingles, was built to replace it and unlike its predecesor was predominantly an African-Caribbean bar. In the early 1990s, in between his Specials stint and his involvement with Jools Holland's band, Rico used to play down at Mingles. The place was just down the road from the 121 Centre which I frequented, and a few of us went down to Mingles a couple of times to see him play. It was no big deal, just a a band playing in the pub in a low key way, but what a band. 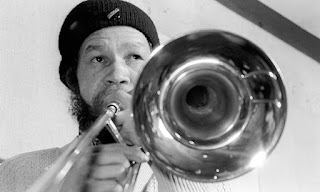 To be honest I thought at the time Rico deserved a bigger venue, but there was a sweet irony in this Jamaican musician playing in that place given its history. In a further ironic twist, a future Jamaican musician might not be able to play in a place like this - not because of racist door policies but because of the loss of venues as a result of more affluent residents moving into the area that was once known as the Front Line. Mingles became the Harmony Bar and then La Pearl, before closing. 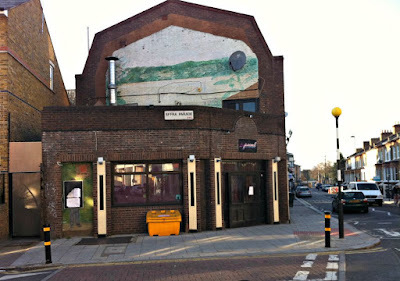 Antic - who run the Dogstar and various other London pubs - acquired the site (82 Railton Road SE24) and applied for planning permission to develop it with flats above and a bar below. Local residents campaigned against it with a 2012 petition stating that 'We strongly feel this site is no longer suitable to be used as a pub or entertainment venue, as the surrounding streets have become more residential and it is too close to these homes'. Planning permission was refused and BrixtonBuzz reported a press release last year that crowed 'London based construction specialists Sorrel Construction Ltd, partner with Lambeth Council to breathe much needed life into a post-riot area... Sorrel Construction Limited have recently announced their latest project working closely with Lambeth Council to dramatically transform a damaged pub on Railton Road into a series of brand new luxury flats'.